When we started thinking about extending our house, Nigel and I drew up some potential plans. Mostly we added boxes onto the existing house, but we could not think of how to integrate any new building with our existing house, and we really did not want the house to look like any addition was just "bolted on". We interviewed some architects, and then had a recommendation from a couple of people for Sara Lambert. She came to meet us and we hit it off immediately. She took our brief and produced some drawings for us. The thing that struck us was how well Sara 'got' how we lived in our house - we basically took these first drawings and they became the basis for our new house plan with some small changes. So far during the project we have made no changes to the plan, and at each stage we just say to each other "this is so much better than I thought it would be". Sara has thought of things that we had not considered, nor noticed on the plan. Our contractors remark how complete the plans are, and how well they work (apparently this is not taken for granted). For us, the investment in an architect has been invaluable; any design or usage decisions were worked out on paper, so no need for costly changes to the plan. The details of the contact with the builder are well defined - if it's in the plan, that's what's in the contract. Typically architects fees work out between 5% and 20% of the building costs, depending on what you get the architect to do for you (manage the contract? handle the permit process? selecting doorknobs? ), in our case the percentage was at the low end of this scale because we focussed on Sara doing the design and actual architecture, and us doing a lot of the leg work. It was a good way to keep costs down without compromising on the finished product of our new house. We were very focussed on the utility of the design, but are delighted we had someone to also focus on the appearance of the house and decorative details. Sara did a great job on creating a design for us that met our needs, and still looks great. The new building is harmoniously integrated with the old house; the floor plan internally flows from old to new, we could not be more pleased. If anyone is looking for an architect - we can wholeheartedly recommend Sara. Work on the house is actually wrapping up now. We are using more of the new space all the time. All the flooring is complete, the trim is all installed and the painters are in this week, then we move on to the final plumbing and electric. 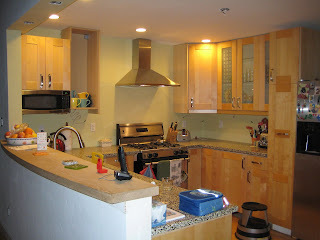 I decided that this post needed a photo of the kitchen (with the new undercabinet microwave installed....3 hours of my weekend that I will never get back!). 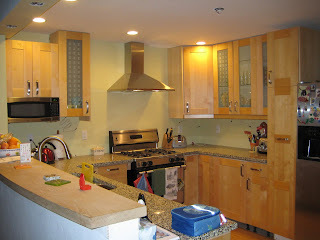 I took the photo from the family room side of the breakfast bar to hide the sink full of dishes. I uploaded it and realized how unfinished it looked with the cabinet door off so I changed over the handle and installed the door and re-took the photo. The cabinet needed some new plastic plugs for the hinges as it's one of our recycled doors on a new frame - but a trip to Ace over the weekend had secured the correct hardware. So thanks to the blog I actually installed the door rather than just thinking about it! I just love my new kitchen - we seem to have so much space. The new kitchen is 18" wider than the old, but that small additional space has given us enough space for a 'U' of cabinets rather than an 'L'. We also got the microwave off the counter which gives more space. 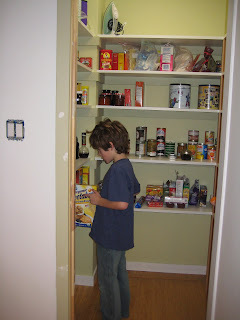 I have never had a pantry before and it seems huge. Please remind me of this in a few months when it's an over-full mess and I'm complaining that I have no storage in the kitchen. Over the holidays we moved into our new bedroom. 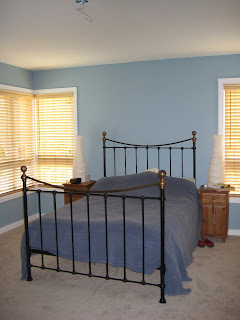 This involved painting, installing the blinds and carpet....and installing the wardrobes. 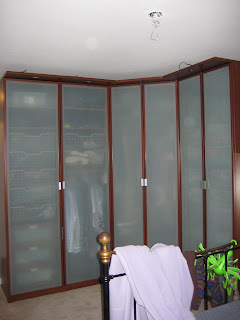 Our new wardrobes are from IKEA and weigh approx 1000 lbs. We borrowed a friend's truck to collect them and spent several days assembling the units. They worked our pretty nicely - you can customize the interiors so we got the space we needed. The split in this case is about 60% me/40% Nigel's space. (Maybe...or perhaps 70/30...or 75/25). Note to self: remove dressing gown and sock hangar before taking photos. The bedroom is not finished because the wall behind the bed will be wallpapered as soon as the wallpaper gets here. Our bathroom is also not yet conncected. 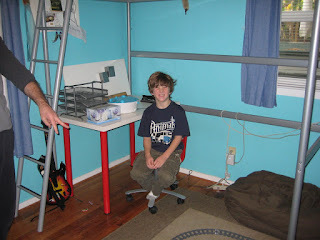 We were not the only ones to get a bedroom makeover - the boys both needed places to do homework etc so we sorted out both bedrooms and got desks for them both. 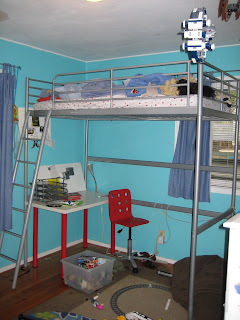 Adam also realized a (small) ambition to have a bed like Thomas's and so he got his loft bed. His desk goes underneath and he's delighted. Fin's room is also much nicer and he has some floor space to play. 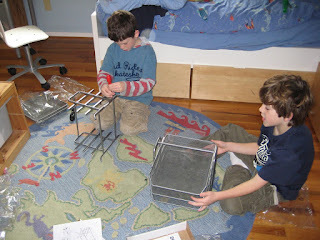 Both boys also got desk organizers from IKEA so since we were in a frenzy of IKEA-assembly they put the units together themselves. You will notice that we didn't let Adam assemble his own bed (tempting though that was).